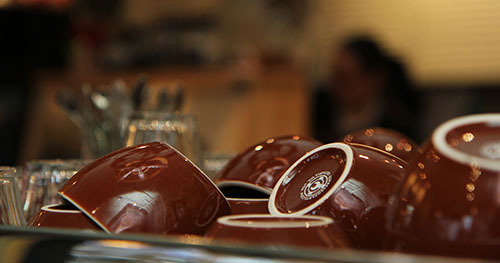 Predrag Grncarski's a cappuccino guy; his wife, Giselle, favors cortados. Not that they ever have time for a coffee break. 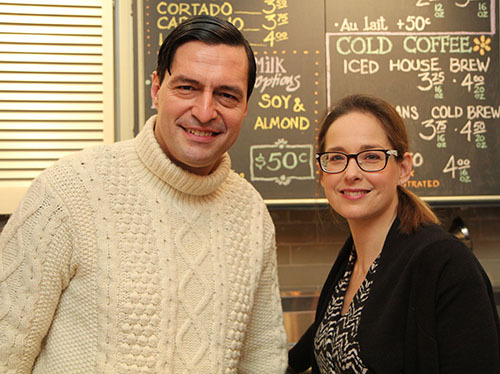 Predrag and Giselle are the owners of the OK Cafe. Which is ironic because they are the owners of the OK Café, a down-home shop that pays homage to the brewed bean. It's hard enough running a business when it's all you do, but Predrag and Giselle are also full-time employees in the events-management business and more-than-full-time parents of 9-year-old Sofia and 6-year-old Natalia. 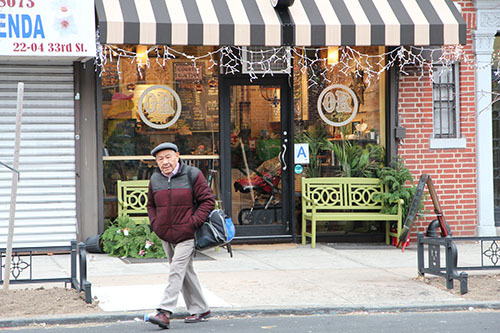 The OK Cafe on 33rd Street at Ditmars Boulevard. "We don't sleep so much," says Predrag, not at all unhappy about it. He excuses himself so he can clear a table as a customer leaves. While he's at it, he holds the door open for a man with a baby carriage. 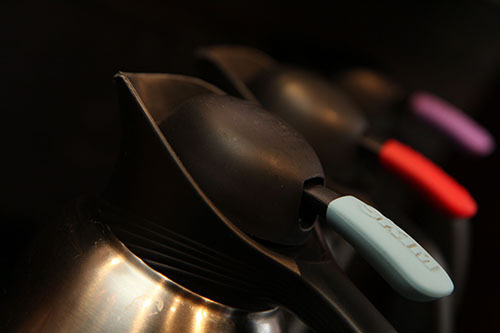 It is their love of coffee that fuels their bodies -- and their ambitions. Giselle, who was born and raised in Minneapolis, and Predrag, who is from Serbia's kaffeklatch-centric city of Belgrade, met after they came to New York. They like to say that it was fate that brought them to the Big Apple because they arrived at JFK on the same June day in 1998. It's quite likely that they passed each other at the terminal. At any rate, a couple of years later, they met and married. Giselle, whose mother owned a dance studio, headed for the stage after college. She went to Europe in search of work and ended up joining a modern-dance troupe in Hawaii before her feet landed her squarely in Manhattan. 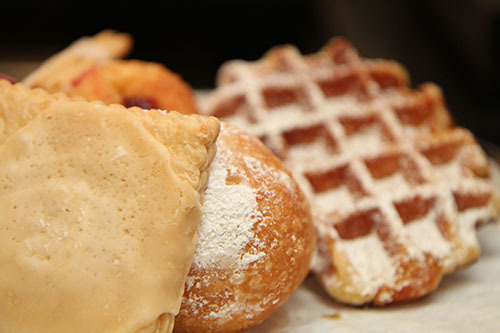 Pastries round out the menu. Predrag, who had a career in banking, was supplementing his income by modeling. When the economic crisis crippled his country and political tensions flared there, he moved to South Africa then Germany. From that base, he worked the shows in Milan and Paris. It was a job with Ford Models that brought him to Manhattan in 1998. Predrag used to be in banking. Such artful endeavors required day jobs, so Giselle and Predrag put in their time catering. They noticed each other at an event honoring the Dalai Lama. Two weeks after they started dating, Giselle moved into Predrag's Astoria apartment. After dancing at her wedding, Giselle pirouetted out of the profession. "I was just spinning my wheels," she says. "And I didn't want to do any more touring because it would have taken me away from Predrag." 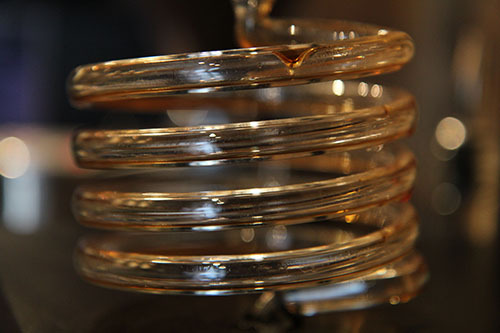 The coil of the cold-drip coffee maker. Tall and agile, Giselle still moves like a dancer. There's a gracefulness to her steps even when her feet are fettered by heavy boots. 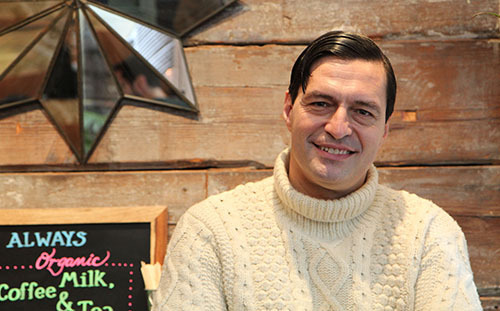 Predrag, who has the classic tall, dark and handsome looks of a matinee idol, also changed course. He gave up modeling. 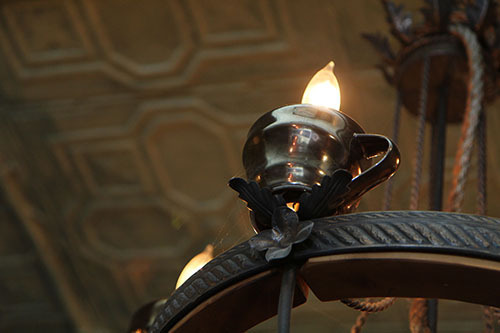 The cafe's chandelier gets its fill. They entered the field of events management. He works days and she works evenings, so they have made their opposing schedules work for them. Around the time Sofia was born, they bought a place in Jackson Heights. Giselle's first career was in dance. "But we kept coming back to do everything in Astoria," Giselle says. It was, Predrag adds, like having an affair: "We felt we were cheating on our neighbors." When they came back, in 2007, Starbucks was the only coffee option, so they found themselves spending a lot of time clutching cups in hip Brooklyn shops. "When we were first married, we thought about starting our own business," Giselle says. "But we couldn't get it off the ground. Since then, we've always been looking for the right moment." They won't be empty for long. That moment came in August 2014, when a 350-square-foot space, former home to a beauty salon, became available. Predrag and Giselle poured all of their savings, and then some, into the project. 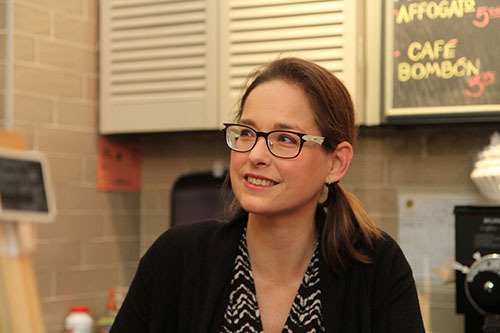 "We wanted to create our own place in the community that would give us a direct connection to the neighborhood," Giselle says. 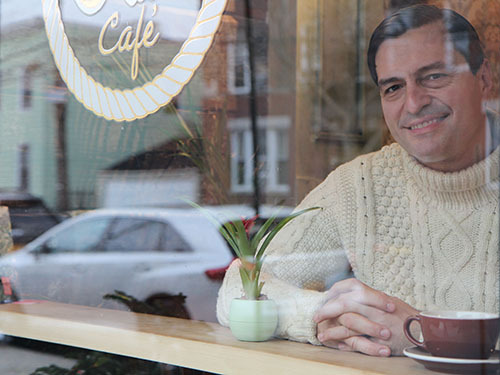 "We called it OK Café and not something like Fabulous Café because we wanted it to be low-key like us. We wanted people to be surprised when they come here." 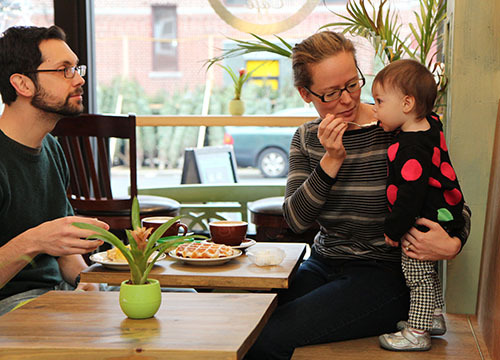 In short order, the OK Café became a success, with TimeOut New York nominating it for the title Best Coffee Shop in Queens. "We were break-even right away," she says. 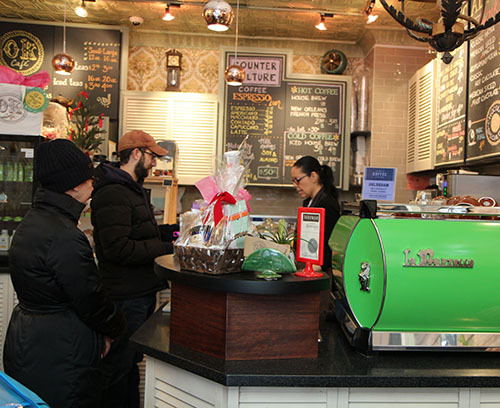 "There are plenty of places to get coffee in Astoria, but we're doing the classic espresso approach. The coffee is the whole show here." She points out the apple-green La Marzocco espresso maker, which was handmade in Italy, and the laboratory-style glass cylinders of the Kyoto cold brewer that drips 12 hours to fill a single pot. Organic teas, plus vegan and gluten-free pastries, round out the menu. Predrag in his favorite window seat. On a Saturday morning, the coffee cafe, which is no bigger than an espresso cup, is packed with parents pushing pricey perambulators. The ceiling is antique tin, the wallpaper is outlandishly ornate, and the aroma, ah, the aroma, is pure perk. It's the kind of place Giselle and Predrag like to bring Sofia and Natalie to for a Babyccino, steamed organic milk with a frothy top. They girls also like the Maple Babyccino, which is infused with the sweet syrup. The OK Café doesn't have a kitchen or a garage or a basement, and that's OK with Giselle and Predrag because they feel right at home here. The barista sets a cappuccino in front of Predrag. The milky foam forms the shape of a heart.